African Zoology hosts a dual celebration as the journal enters its 50th and has seen the move of the journal to NISC (Pty) Ltd, in partnership with Taylor & Francis. In celebration of the journal’s various milestones, including a new cover which will change annually, the first issue of 2015 is now available for free for the remainder of 2015 and can be found here. African Zoology is the official publication of the Zoological Society of Southern Africa and has been in existence since 1965. The journal is listed on the Science Citation Index and has a 2013 two year Impact Factor of 0.848 with a five year Impact Factor of 0.929. It is also accredited with the South African DHET and included on Scopus. African Zoology joined NISC from 2015 and accepts manuscripts through ScholarOne Manuscripts. ScholarOne Manuscripts, a Thomson Reuters owned product, is the industry leading manuscript submission and review system. While African Zoology has seen a number of changes it's objective remains unchanged. The journal aims to remain a general zoology/biology based journal and will accept papers globally that advance theoretical thinking and those that focus particularly on African Fauna. 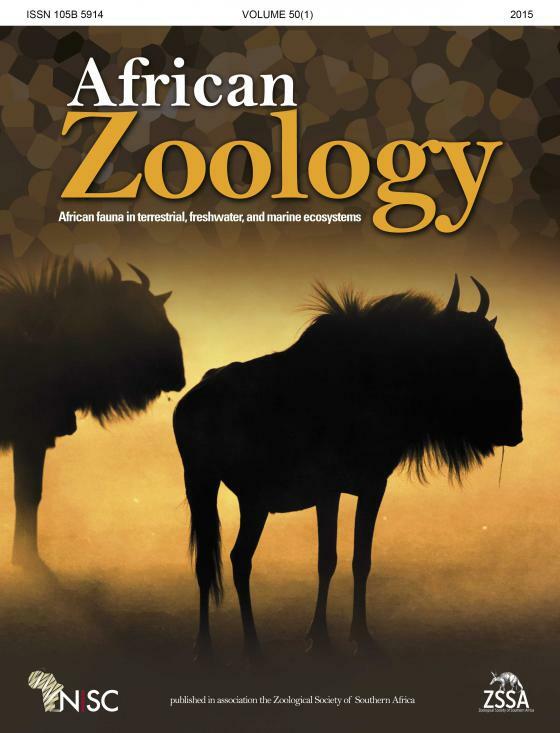 African Zoology focuses on research pertaining to African fauna in terrestrial, freshwater, and marine ecosystems, and publishes full-length papers, critical reviews, short communications, letters to the editors, as well as book reviews. Research from other regions that advances practical and theoretical aspects of zoology is also considered. The journal’s Impact Factor has risen steadily in recent years, as a result the increasing quality of submissions and robust peer review, leading to a steady increase in citations. The journal is committed to continuing this trend. “Our endeavour thus as the incumbent Editors-in-Chief is to take African Zoology to new heights and improve the rankings of this journal and make it a sought-after journal in which to publish high-quality research." As part of the NISC (Pty) Ltd – Taylor & Francis partnership African Zoology will have increased visibility globally bringing it in line with other modern journals and also allowing authors the option of publishing their article Open Access.